The pre-teen bedroom is fun, funky and inspiring. it displays hand painted wallpaper and a bespoke desk area. Love the chair! - Where is the desk chair from? Go for boldAs the old saying goes, ‘If you can’t fight, wear a big hat.’ This attic bedroom shows off its sloping walls with pride and is consequently a bright, energetic space. A minimal bed and desk area slot in neatly and make this teenager’s room a fun retreat. Use space under a windowWhen space is tight, you may have no choice but to position a bed under a window, but this doesn’t have to be a problem. Just make sure the window is locked for safety, and fit blackout blinds to prevent early morning sun disturbing your sleeping tot. Big up the walls and ceilingDrawing the eye away from the limited floor footprint and up to the walls and ceiling helps create an illusion of space. So rather than paint these surfaces in white, treat them to dramatic wallpaper and a handful of patterns, and then leave the desk and bedding plain and neutral. Kate Burt added this to Ask an Expert: How Can I Furnish and Decorate a Small, Square Room? Cocoon a small spaceIf you think a small space should only be painted in a pale colour, think again. In fact, a bold paper can bring a small space to life and make it feel special, designed and cosy, rather than cramped. And if you are feeling really brave, consider using more than one design. 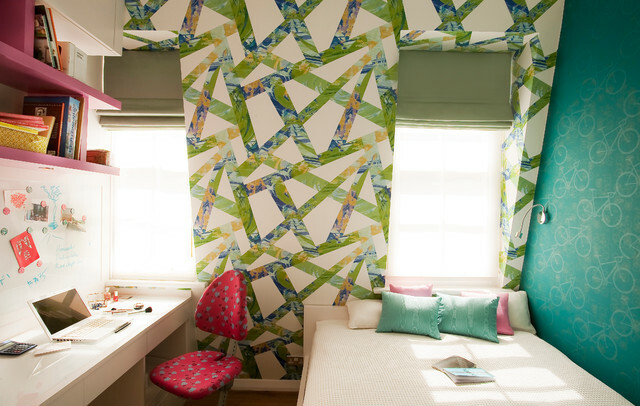 Two contrasting wallpapers might sound like an interiors nightmare, but in this teen bedroom the result is fresh and fun. Go for bold. As the saying goes, “If you can’t fight, wear a big hat.” This attic bedroom shows off its sloping walls with pride and is consequently a bright, energetic space. A minimalist bed and desk area fit in neatly and make this teenager’s room a fun retreat.